Omar Hadi has been at the forefront of Djibouti’s transformation into one of the fastest growing logistics hubs in Africa. He has spearheaded projects worth more than $15 billion, including the historic expansion of Djibouti’s world-class port facilities, the development of a new free trade zone, and the launch of a new passenger and cargo airline, Air Djibouti. Mr Hadi has almost four decades of experience working in the maritime transport industry. Between 2008 and 2011, he ran Nigeria’s second busiest port in Lagos. He began his career with the Port of Djibouti in 1978, rising to the position of Commercial Director in 1999. 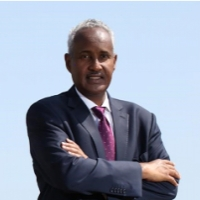 In this time, he has played a central role in forging Ethiopia and Djibouti’s strong trade relationship, initially as one of the first port officials to visit Addis Ababa in the early 1990s, and later playing a major role in Ethiopia’s strategic shift towards the Port of Djibouti in 1998. Today, Djibouti is a vital partner for Ethiopian trade, serving the country’s population of more than 100 million people. Djibouti’s ports handle the bulk of Ethiopia’s maritime trade, through the new Addis Ababa-Djibouti electric railway and an expanding highway network. Fluent in English and French, Mr Hadi holds degrees from Le Conservatoire National des Arts et Métiers in France, and the World Maritime University of Sweden. A member of the Chartered Institute of Transport, he is also a respected thought leader on international trade and logistics, writing for international media outlets including China Daily and CNBC Africa.